After Dr. Grundfest earned his Bachelors of Science degree from Swarthmore College (1974), he studied Neurophysiology and Biochemistry with the Nobel Laureate Dr. Eric Kandel at Columbia University (1774-76) and received his medical degree from Columbia University College of Physicians and Surgeons (1980). Dr. Grundfest conducted his internship and general surgery residency at the University of California at Los Angeles (UCLA) (1980-82) and Cedars-Sinai Medical Center (1983-85). After serving for many years as a physician and surgeon, Dr. Grundfest was awarded the Dorothy and E. Phillip Lyon Endowed Chair in Laser Research and Development (1991–2001) at Cedars-Sinai. Early in his career, Dr. Grundfest was best known for his cutting edge work on the excimer laser for medical applications. Warren Grundfest, born in Little Rock, AK on August 2, 1952, grew up in Belleville, NJ as a member of a family devoted to the practice of medicine. His father, Jack, was a general surgeon and chief of surgery at several area hospitals. His Aunt Rose was a professor at the University of Texas Medical School in Galveston; his Uncle Harry was a professor of neurophysiology at Columbia University, NY; and his older sister, Sharon Grundfest-Broniatowski, MD is a colorectal surgeon at the Cleveland Clinic, OH. 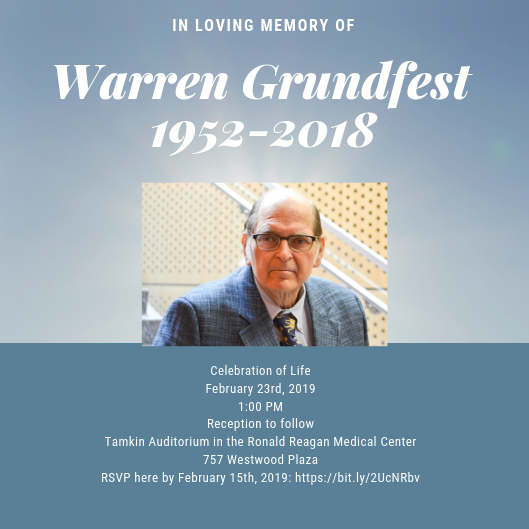 Dr. Grundfest is survived by his wife Andrea K. Scott, formerly an archeologist and for the past thirty years an attorney and bioethicist living in Los Angeles, and his mother, Karolyn S. Grundfest of Belleville.